Sometimes I want to say things that don't quite hang together; humour me! First, the pherome moth traps work, trapping the males so they don't breed. When we left the apartment for our recent trip, one lonely SOB had stuck on the trap in Le Duc's clothes closet. By the time we returned, a dozen of the males (who think they have found a hot girl moth) had snuffed it on the sticky cardboard. Give them time; we had the traps in closets for maybe two months before we got this result. We also came back from France loaded...with moth products. I could not find a Kapo supplier in Canada, so I stocked up on this diffuser, designed to kill mature moths and larvae. Listen, this moth thing is big, and they are supremely hard to vanquish; I am still fighting their low-level but stubborn presence. Even my Buddhist friend who will not swat a mosquito has the traps. If you are entrepreneurial, I suggest you start an e-commerce biz that specializes in proven products. Everyone I talk to has a moth story, none are pretty; climate change seems to have enhanced the pests' ubiquity. Let's segue to the marbles. In reading how to best accessorize my newly-grey hair, I ran across a quote from Betty Halbreich, Berdorf's famed personal shopper, who said, "My grey-haired ladies? I bead 'em up." She's a fan of chunky strands of peridot, coral, amethyst, and of course, pearls. Then Kirsten Giving showed us her luscious pieces. Though not for sale, they danced in my mind. She threw a selection of pieces made over her winter in Florida into her tote bag, and I wanted every one of them! My newest piece: Big marble-sized Greek porcelain "donkey beads", antique silver buttons, trade beads and assorted bits from her travels. The Greek-flag-blue enlivens a white tee, denim shirt—nearly everything I have. And a moth will not even be tempted by beads. As a single woman, I avoid bracelets with lobster-claw clasps, they're too difficult to manage on my own. You need a partner to put them on and take them off for you. 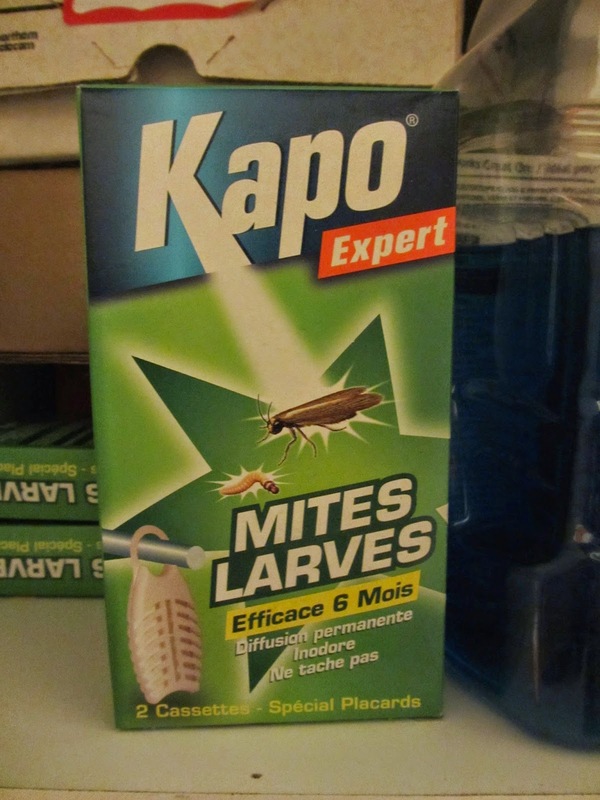 I use Raid fumigators 3 times a year, so that the only insects I see in my house are dead ones! You have to remove plants & pets when you set them up, then leave the house for a few hours while they're working. Love the beads (really love them), but, of course, I'm interested in the moth diffuser. Is there something in it that's not available in Canada/US? I guess it's too soon to tell if it's effective. 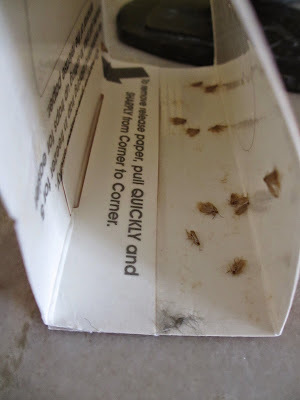 Rita: When I read the product specs on Johnson & Johnson site, Raid Fumigator is not specifically identified as killing moths (see http://www.raidkillsbugs.com/en-us/products/raid-fumigator-fumigating-fogger). Perhaps the copy on the web site is incomplete? Over the years I have conquered moths, and was moth-free for at least a dozen years. Once back, hard to vanquish. Perhaps you too can stock up when you are in France? Thank you for sharing the moth-killing information, this post will go on file for future reference. Those beads are gorgeous, I love the rich colouring and variety of materials. Isn't it wonderful to have such talented friends. I found two holes eaten in a sweater recently. Oh dang. Pheremone traps sound like a great place to start - thank you! LPC: The traps are easy and it's fun in a slightly creepy way to check how many are caught. Even in places I did not see any, aha! Hello! Ah, thank you for the delightful comment on my beads! I am crazy about your new piece and know you will be so happy pairing it up with your pretty clothes. A few years back I saw an ad for a pretty blue bracelet and became determined to make one. While not as spectacular as yours, I do enjoy it. Re the moths. Years ago we partially lined our closets with cedar boards, and used leftover pieces to the drawers of one of my chests of drawers. Everything in the dresser and closet has been safe, though good screens on windows and the sliding door help! Kirsten: Sorry to shake your confidence, but cedar's efficacy is not good IF you already have moths, according to the research I've had to do. Cedar lining deters moths (but does not kill adults if they are present) and many sites say "there is no scientific evidence that cedar works". The best use for cedar is in an airtight application (such as a chest) and the boards must be sanded regularly (at least 1x year) to bring up the oils in the wood. Though the webbing and casemaking clothes moth can enter a home from outside (attached garage storage is a prime culprit), even down chimneys, they are also carried in on shoes, clothes, and upholstered objects and fabric like wool or silk imported from a vendor- the eggs are too small to be be seen. Ugh. I've been moth-free for years, too, and then I got a sweater back from the cleaners and noticed it had several tiny holes. Did you actually see any moths before you realized? Or can you have a moth problem without seeing any! And timely post on the jewelry -- I was just thinking that when I'm in New York this weekend I should look for another chunky necklace -- the single one I have is getting a lot of wear, and the second one I have (had?) has come apart and needs to be restrung on leather cord. Sisty: Many, many persons do not know they have moths till they see the damage. Moths are good at hiding! NYC is a fun place to shop for jewelry though in the last few years I have done so, I’ve had sticker shock. But then, I do about so many things, these days. Yes, I realize that cedar is not the way to kill those moths that exist, but I have been very lucky. I always try to swat any that arrive in the house. When thrifting clothes, they go in the wash FIRST (or drycleaners) because I know that there are so many in such products. If a hole appears they can often be carefully repaired using the "weaving" technique, which my non-sewing mom taught me back in high school, especially on dark clothes. So, beads are better (LOL). The traps did not work for us -- one or two lost males were all we caught. We've had to scour the closets and other areas and kill them throwing out anything that was infested. We also put several potential feeding spots (i.e. Navajo rugs and cashmere sweaters)in the freezer to kill any eggs. Surprises our guests, but saves them. Lynn: I'm freezing too (but alas, big, deep chest freezer did not make the move). Right now we have a carved Mexican mask in there b/c I found a moth crawling on it. You are right, the traps are not the sole solution, but they are easy and non-toxic. (Also, they have to be fresh. I'm changing them every other month.) I am into all the weaponry I can assemble. We'll go a few days, even a week, and think "There!" and then see one. Dadgummit they're stubborn. I'm bookmarking this as well. We don't ever see them on the island (hastily looks around for wood to knock on) but they show up periodically at the condo. A preventative war will be fought to assert our boundaries. materfamilias: This morning I found two fat moths strolling on my as-yet-unworn wool coat. I supposed they had enjoyed a late breakfast together. The fight continues. Duchesse, I think the Raid fumigators may kill moths, but the residual effect doesn't last very long. So, if a moth gets inside in the first couple weeks after fogging, its probably a goner, but not if it gets in 2 months later. Also, probably doesn't kill the eggs. When we had a dog, I would have to use the foggers every month during flea season instead of the usual 4 months because of that. Love the beads. Just home from seeing documentary film "Iris" about Iris Arpfel, style icon & "octogenarian starlet"
We use pheromone traps to know when to tread coddling moths on apples - a really nasty pest in Oregon. Had no idea they had a sartorial function. Hope your moths stay clear of cashmere. Moths.... ooh how I hate that, although haven't had the problem, yet, in new place. At least the beads are safe, and how lovely they are. Mardel: After many rounds of cleaning, airing, aggressive vacuuming, and killing any live moths, plus the pherome traps- we have not seen a moth for maybe 2 weeks. I am holding my breath- there IS a breeding cycle.